If you are using an iPhone, it’s a good idea to regularly backup your data such as contacts, to survive from unexpected data loss caused by iOS upgrade, jailbreak, or even iPhone broken, lost or stolen. Have no idea of how to backup contacts on iPhone? Just refer to the following 3 methods. iTunes can not only help you organize music, movies, and TV shows, but also enable you to back up your iPhone data, including contacts. Here are the simple steps regarding how to backup iPhone contacts with iTunes. Connect your iPhone to the computer and launch iTunes. If you don’t have iTunes installed, you can download it from Apple.com. Click the small iPhone icon when it appears, then tap “Back Up Now” in the “Summary” section. Wait for iTunes to create a complete backup of your iPhone, including your contacts. iCloud is a cloud storage and backup service provided by Apple Inc. You can easily sync and store data like contacts, photos etc. on iPhone running iOS 5 or later. 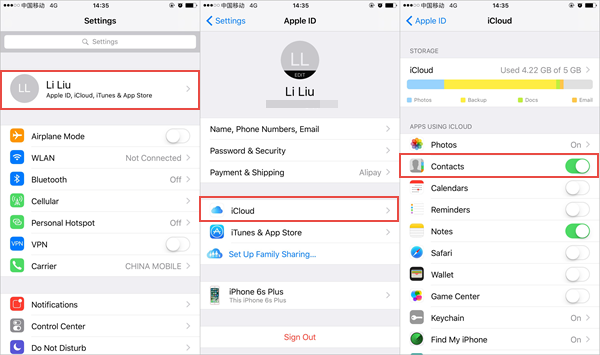 The following steps will introduce how to sync iPhone contacts via iCloud. On your iPhone, go to “Settings” and tap on your Apple ID. If you are not signed in, enter your Apple ID and password, then tap “Sign In”. Click “iCloud” and slide “Contacts” to the On position. Tap “Merge” if prompted. Your iPhone contacts will immediately be synced with your iCloud account. 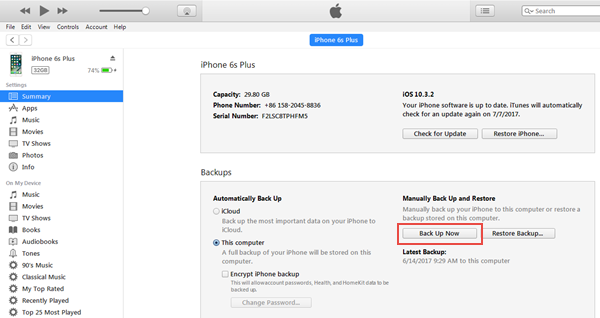 Also, you can manually click “iCloud Backup > Back Up Now” to perform a full iCloud backup to save your contacts. An alternative way to backup iPhone contacts is using Gihosoft Mobile Phone Transfer. It is professional phone data backup and restore software, which enables you to transfer contacts from iPhone to PC and restore previous backups to iOS devices whenever you need. This iPhone Contacts Backup app supports iPhone X, iPhone 8/8 Plus, iPhone 7/7plus, 6S/6S Plus, 6/6 Plus, SE, 5S, iPad, iPod touch etc from iOS 5 to iOS 11 or later. 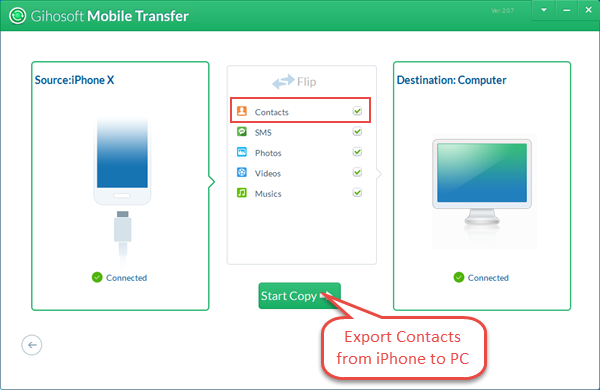 As for how to export contacts from iPhone, please follow the simple steps given below. Step 1: Download, install and run the Mobile Transfer Software on your computer. Step 2: Tap “Backup Your Phone”and then connect your iPhone to PC via a USB cable. Step 3: Check “Contacts” and click “Start Copy” to export contacts from iPhone. Backing up contacts on iPhone with iTunes or iCloud is quick and easy. Please note that the two Apple methods won’t allow you view contacts in the backup files unless you restore your iPhone with the iTunes or iCloud backup you’ve made. In comparison, Gihosoft Mobile Transfer allows you to selectively backup iPhone contacts to computer in readable and printable formats. Additionally, you can easily transfer contacts from iPhone to iPhone. If you found your iPhone contacts lost or disappeared, but there is no backup available, please try to use Gihosoft Free iPhone Recovery. This program can help you restore lost contacts on iPhone without backup.